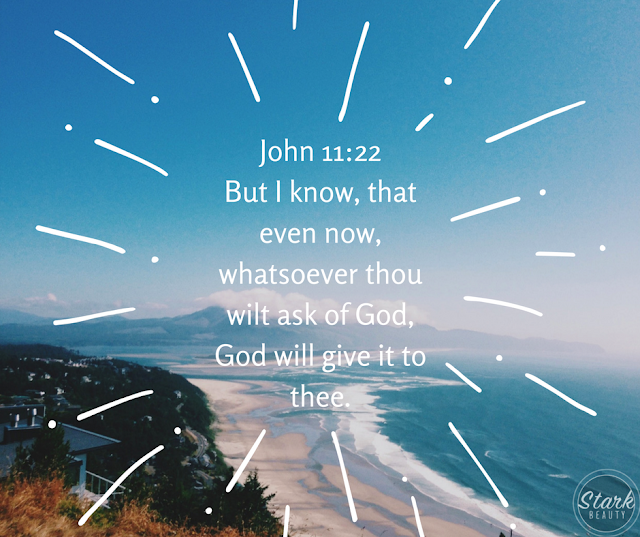 But I know, that even now, whatsoever thou wilt ask of God, God will give it to thee. Martha ran outside to meet Jesus! She said to Him, "If you were here my brother wouldn't have died!" BUT then she said, "I know, that even now, God will give you whatever you ask." AND guess what!? Lazarus was raised from the dead! Our Father will do the same for you! Situations in your life may look 'dead' but get ready because Jesus's resurrection life is going to redeem those situations! Whatever you are believing for may look like it is never going to happen. Lazarus was dead for four days! If you were to look at this situation from a natural perspective it would look hopeless, but we serve the God of hope! The God who calls things that are not as though they are! The God who raises the dead, the God who heals the sick! We serve the God who is bringing LIFE to every situation in your life! Stop looking with your natural eyes and start rejoicing, LAZARUS was raised! Be expectant today! Those situations in your life that look dead are coming to life!